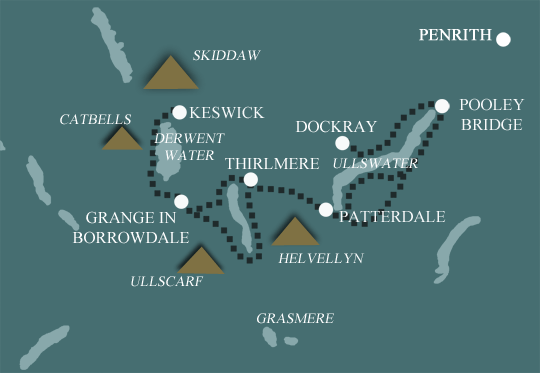 This is one of our own routes, winding around the Lakes of Ullswater, Thirlmere and Derwentwater, then climbing over the mountain passes that separate them. It takes in the lake shores, fells and mountain passes of the Northern Lakes, stopping in some of the prettiest villages of Lakeland. On the way you will experience quiet woodlands, plunging waterfalls and spectacular views as you climb over the fells. Wherever possible we have built in high and low level alternatives, so the route can be adapted to suit your ability, or the weather! This is a fine introduction to the North Western lakes, encompassing plenty of variety. You will be transferred to the start of the route at Dockray. The route passes through rolling farmland north of Dockray before descending through woodland to Aira Force, one of the Lake District’s most renowned waterfalls. From here woodlands above Ullswater lead to Pooley Bridge, a small village at the head of Ullswater, for the first overnight stop. From Pooley Bridge the lower level route takes the eastern shore of Ullswater over its entire length, to the second night’s halt at Glenridding. The path follows the lakeshore closely through fields and woodlands skirting the lower fell sides of Hallin and Place fells. The alternative higher level route goes through the remote hamlet of Martindale to the summit of Place Fell, with spectacular views over the lake to Helvellyn. The third day takes the route to Sticks Pass (750m), high on the Helvellyn ridge, on an established path past the old mine workings, before dropping more steeply down to Thirlspot, the next overnight stop. Thirlmere, Bassenthwaite, Ullswater, Skiddaw and Blencathra can all be seen from the pass. There are two alternatives for this day. They both climb out of the Thirlmere valley over the Ullscarf ridge to Watendlath, a secluded farming hamlet complete with tarn, ducks and tea shop! The route continues through wooded valley sides into Borrowdale, one of Lakeland’s prettiest valleys, for the night’s halt. The final day passes along the shores of Derwentwater and for the higher level route, over Cat Bells enroute to Keswick, the end of the trip. From the top of Catbells there are spectacular views of the Northern fells, Skiddaw and the lakes of Derwentwater and Bassenthwaite. The lower alternative takes the lakeshore path along Derwentwater, through ancient oak forests. The North Lakes Traverse has been designed to cater for a variety of fitness levels and experience. Any reasonably fit person should be able to complete the lower level option, whilst the higher level alternatives provide something for the more experienced fell walker. Terrain: A mixture of typical Lakeland countryside, from fields in the valley bottoms and wooded lower slopes, to higher mountain passes as the route crosses the Helvellyn range and remote moorland en route for Borrowdale. What’s it like underfoot? The paths and tracks followed over most of the route are well defined and maintained. There are however sections of relatively high and remote mountain terrain, where the paths are rougher, and boggier. How Much Up & Down? The climb over Stick Pass between Patterdale and Thirlmere is 600m, and the following day the route climbs over 400m en route for Borrowdale. The other days involve less ascent and descent. Signposting: None – this is one of our own routes. You will need to use the route description and map. Navigation: Pretty straightforward on the lowland sections, but you may encounter hill fog or low cloud on Sticks Pass and between Thirlmere and Borrowdale (where the path is indistinct for a while) – so you need to be able to navigate. A route description detailing both high and low level alternatives. Maps 2 Ordnance Survey Explorer (1:25000) maps covering the entire route. General travel information for the North Lakes area will be in your holiday pack including train and bus timetables where available. By Air: The nearest international airports are Manchester (MAN) or Newcastle (NCL). You can then travel by train to Penrith (approx 2 hours from both) and then bus or taxi to Keswick (18 miles). By Public Transport: Keswick’s nearest railway station is Penrith (PNR). You can then travel one of the regular buses to Keswick, or a taxi (18 miles). Keswick has a central bus station, and you are usually no longer than a 5/10minute stroll to your accommodation, or a couple of minutes in a taxi. By Public Transport: You can travel by bus from Keswick to either Penrith railway station (18 miles) or the larger station in Carlisle (37 miles). By Road: A66, which passes by Keswick, to Penrith (18 miles) for the M6 motorway. “Off the beaten track” – explore some of the quieter paths of the North West Lakes. Great views of Ullswater, the Helvellyn range, and the Borrowdale Fells. Visit the delightful hamlet of Watendlath, hidden away in the fells.